The compact, water-resistant PMX-2 receiver features built-in Bluetooth®, so you can stream music stored on your Apple® or Android® phone, or tune into Pandora® and enjoy your favorite playlists. If you prefer to plug in, you'll find an aux input, plus a USB input that will charge your phone while you're playing music. Speaking of charges, the PMX-2 also has a low-voltage warning alert built-in, so you won't accidentally drain your battery. This versatile receiver features an AM/FM/Weather tuner, a 7-band EQ for adjusting the tone, and a built-in amp that'll do a great job of powering the speakers in your ATV. *Installation note: For RZR S 900 and RZR 4 900 installations, you will need a RZR 1000 center pocket. See Details for more information. Perfect addition to my system in my rzr.Had just a volume knob off amp prior.you can't go wrong buying this unit. With built in amp,eq.and Bluetooth it made my system sound crisp and clear. 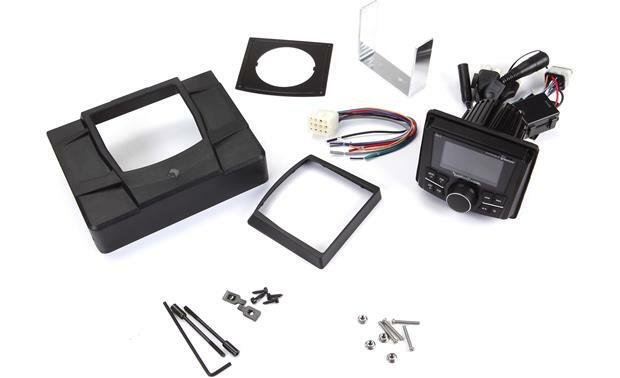 Installation Kit: The included dash kit is designed to facilitate the addition of the Rockford Fosgate PMX-2 digital marine source unit into select Polaris RZR model ATVs. This kit is custom molded to match the existing dash and mounts in place of the center pocket door using the factory (OEM) mounting holes. All mounting hardware for the source unit and dash kit are provided. Compatibility: The included dash kit is specifically designed for the following 2014-2016 Polaris RZR model ATVs. Note: Must purchase storage pocket from Polaris for a 2014 and up RZR XP/XP4 1000 to utilize this dash kit on 2015 and up RZR XP/XP4 900 models. 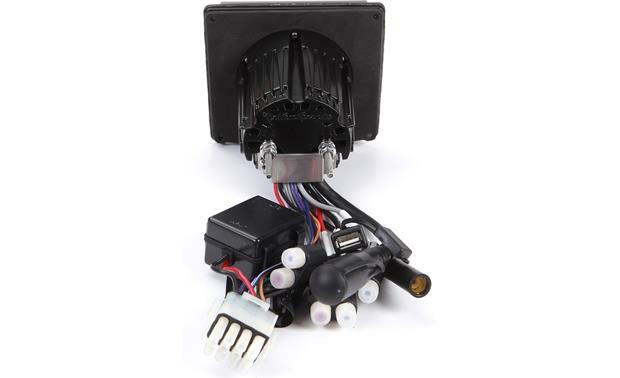 Wiring Harness: The included wiring harness will need to be hardwired to your Polaris RZR model ATV's electrical system and your installed speakers (it is not plug & play). Marine Certified: Rockford Fosgate's PMX series of source units are fully tested against UV radiation degradation as well as tested to IPX water intrusion standards. They are also fully tested for ever changing environmental conditions such as temperature extremes, as well as vibration testing to make sure they can take a bump and keep performing. The PMX-2 is protected against Dust, UV, Temperature, Water, Corrosion & Vibration. Applications: The PMX-2 digital media receiver is designed for marine and motorsports systems. 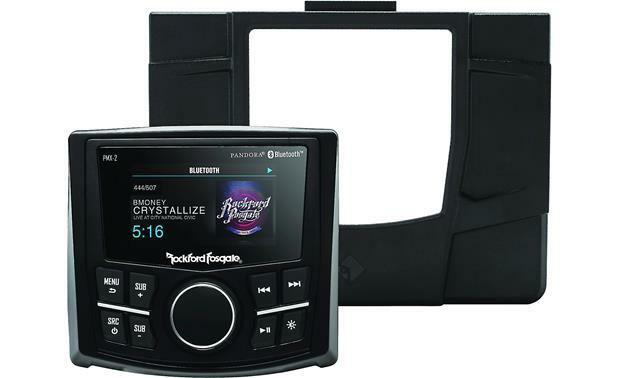 Optically Bonded LCD: The Rockford Fosgate PMX-2 features a 2.7" TFT color LCD for optimum viewing, even in full sun, that is optically wet bonded to prevent any dust or moisture penetration. There are two brightness settings for the LCD screen. Water Resistant Control Knob: The PMX-2 uses a water resistant rotary encoder knob, along with push-button controls that feature white LED illumination. Voltage Gauge & Warning: You can check the voltage of your system through the PMX-2's menu. The unit also provides a Low Voltage Warning Alert. EEPROM (Electrically Erasable Programmable Read-Only Memory): The Rockford Fosgate PMX-2 features an EEPROM memory system which retains settings even when power is removed. 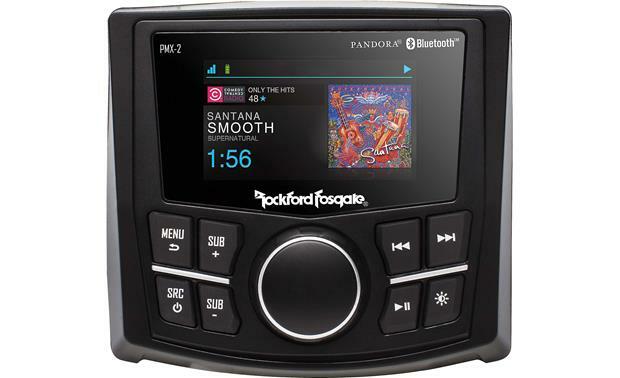 Bluetooth Music Streaming: The Rockford Fosgate PMX-2 offers built-in Bluetooth (version 3.0+EDR) for wireless music playback from your Bluetooth-enabled Apple iPod/iPhone/iPad, Android smartphone/tablet, Windows phone, Blackberry, and more. You are able to stream stored music and music apps from your Bluetooth device to the PMX-2 marine receiver. You can control basic playback functions like Play/Pause, Previous Next/Track and Repeat/Shuffle for stored music and music apps on your device. When using a Bluetooth AVRCP 1.4 compatible device like the Apple iPhone (iOS 5.0+) or an Android smartphone (OS 4.0+), you can even browse your stored music by category (Playlist/Artist/Song/Genre). The PMX-2 will also display your device's song/artist information with album art. Optional Wired Remotes: The PMX-2 features a wired remote input which is compatible with Rockford Fosgate's PMX-1R & PMX-0R wired remote controllers (both sold separately). In most cases you will need one of Rockford Fosgate's extension cables (sold separately) to connect a wired remote controller. Up to 3 remotes can be added to one marine receiver using PMXYC Y-cable (sold separately). USB Port: The Rockford Fosgate features a rear-panel USB (type-A) port for connection of a USB mass storage class device, like a USB thumbdrive or flashdrive. The unit supports playback of MP3 music files loaded onto a USB MSC device. You are able to browse your music by folders, as well as control basic playback functions like Play/Pause, Previous/Next Track and Repeat/Random. iPod/iPhone Direct Connection: The Rockford Fosgate PMX-2's USB port can be used to connect your Lightning-connector or 30-pin dock connector iPod/iPhone to the head unit. Simply use the cable that came with your iPod/iPhone device or a 3rd party Apple certified cable (sold separately). The PMX-2 supports audio playback, music navigation, information display (including album art), and charging of your compatible Apple device. Music Control: The PMX-2 lets you navigate your Apple device's stored music by Playlist, Artist, Album, Song, Genre, Podcast, Composer, or Audiobook. The head unit also offers basic playback functions like Play/Pause, Previous/Next Track, and Random/Repeat. Newer Apple devices with iOS 6.0+ will remain unlocked while connected, so you can access music apps on your device. Older Apple device's clickwheels & touchscreens will lock when connected to the PMX-2. Aux Input: The Rockford Fosgate PMX-2 is fitted with a rear-panel stereo RCA AUX input to connect an external audio source. You can give the Aux input a custom name. AM/FM Tuner: The PMX-2 features a built-in AM/FM tuner with manual, seek, and preset tuning. You can store up to 18 FM and 12 AM preset stations; these presets can be stored manually or automatically. You can set the tuner to Local or Distance tuning. The Local option tunes to nearby radio stations with sufficiently strong signals for good reception. In areas where reception is poor, switching to Distance tuning enables the unit to tune in to more distant stations. You can choose between US or European tuning. Weather Band: The Rockford Fosgate PMX-2 is also equipped with a built-in weather band tuner. Select from weather band frequencies between 162.40 to 162.55. The free Pandora App (either from Apple's App Store or Google Play) lets you play music from the Pandora music service through the Rockford Fosgate PMX-2 using your USB-connected or Bluetooth-paired Apple iPhone (iOS 9.0+), or Bluetooth-paired Android smartphone. Your Apple iPhone must be connected to the PMX-2 via the appropriate the Dock-/Lightning-cable that came with your iPhone or via Bluetooth. Your Android smartphone must support A2DP/AVRCP/SPP Bluetooth profiles and be paired with the marine receiver. Your iPhone or Android smartphone will also need an active Data Plan account with connection to the Internet via 3G, EDGE, or WiFi. The PMX-2 provides control over the Pandora music service and displays Artist, Album, and Song information. MOSFET Amplifier: The PMX-2 is equipped with a MOSFET amplifier. Compared to conventional power supplies, the MOSFET amplification circuit is smaller and more efficient, and it delivers increased power with less distortion and absolutely zero on/off switching noise. More power means louder and cleaner music at higher volumes because you're not pushing the limits of the amplification circuit. 4V/4Ch Preouts: The Rockford Fosgate PMX-2 is equipped with two pair of 4-volt preamp outputs (Front & Rear/Sub). You can configure the Rear/Sub pre-out for rear speakers with fading capability or as a non-fading sub output. You can turn off the unit's internal amplifier, you plan on using only external amps. Equalizer: The PMX-2 is equipped with a variety of EQ presets, and 7-Band EQ, and Rockford Fosgate's Punch EQ. High-Pass & Low-Pass Crossovers: The PMX-2 provides a high-pass crossover for the front & rear channels which can be set to 60Hz, 80Hz, 120Hz, or Full-Range. The unit also provides a low-pass crossover for the subwoofer output that can be set to 60Hz, 80Hz, 120Hz, or Full-Range. 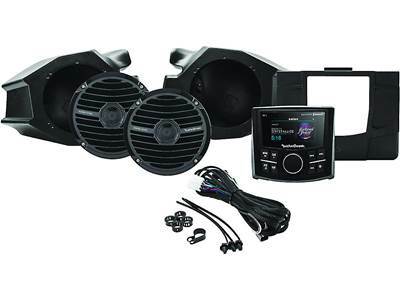 Searches related to the Rockford Fosgate RZR-STAGE1 Stage 1 audio upgrade kit for 2014-16 Polaris RZR ATVs: includes Punch PMX-2 digital media receiver and mounting kit.